Image Size: 30 X 25 in. “This painting is not about a woman I’d like to be with, but rather it’s homage to a town that is so very close to my heart,” says artist Steve Hanks. At the risk of sounding like the Chamber of Commerce, Aspen is a very special place, averaging over 300 days of sunshine year and yes, the skiing is legendary. It’s also home to Steve Hanks’ original painting gallery and decades of wonderful memories for the artist and his three children. Hanks’ command of watercolor craft is on full display in this portrayal of confident anticipation of a great day on the slopes. 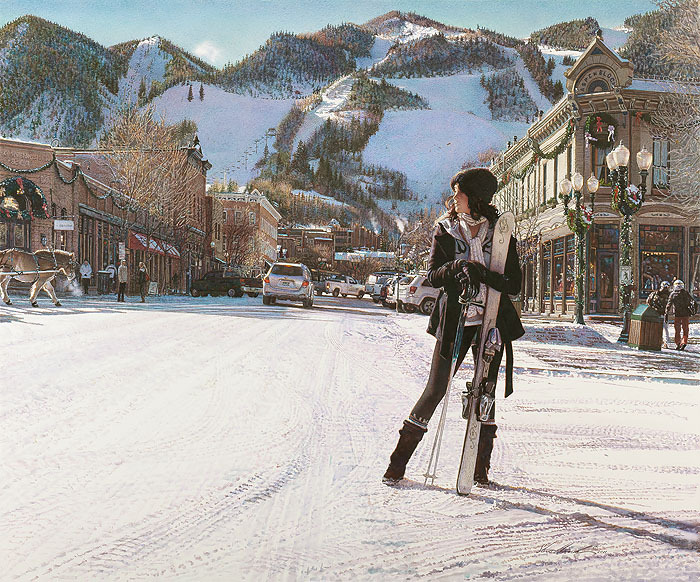 If you’ve ever been here, or hope to go, this love letter to Aspen will ensure that you hold onto that dream.